​A thoughtfully designed and well-constructed facility is critical to supporting an organization’s purpose and mission. That’s why at Opus, our mission is stated in terms of our clients’ missions: Driven to exceed your expectations and empower your mission through the buildings we deliver. This philosophy places our clients’ purpose at the center of everything we do, and it has led to many repeat clients, including ConAgra Foods. ConAgra Foods is one of North America's leading packaged food companies, distributing a multitude of recognized national brands to grocery, convenience, mass merchandise and club stores, as well as to restaurants, foodservice operators and commercial customers. For almost three decades, ConAgra Foods and Opus team members have shared a rewarding partnership based on respect and trust. Since constructing ConAgra Food’s Omaha corporate campus in the early 1990s, our team has designed and built a nationwide network of 11 temperature-controlled and dry distribution facilities for ConAgra Foods in eight states, totaling more than five million square feet. Efficient logistics and distribution is vital to ConAgra’s mission of “making the food you love.” Recently, when the company set out to consolidate multiple Midwest distribution facilities into one centralized location in Frankfort, Ind., they turned to us once again. Completed in June 2015, the custom-designed distribution center is 1.6 million square feet – the largest building ever constructed for ConAgra Foods. With a keen understanding of ConAgra Foods’ business model and specific needs, Opus’ design-build process enabled completion of the immense build-to-suit project in an expedited timeline. Construction lasted 52 weeks, wrapping up six weeks ahead of schedule. ConAgra Foods moved into the new facility just 16 months after selecting the site. In addition to the enormous warehouse, the distribution center features 15,000 square feet of office space, 34-foot clear height in the warehouse, 125 dock doors, 10 rail doors and more than 850 trailer parking spaces. Throughout our company’s history and tradition, our core purpose at Opus is designing and constructing buildings that support our clients’ most important ambitions, goals and missions. 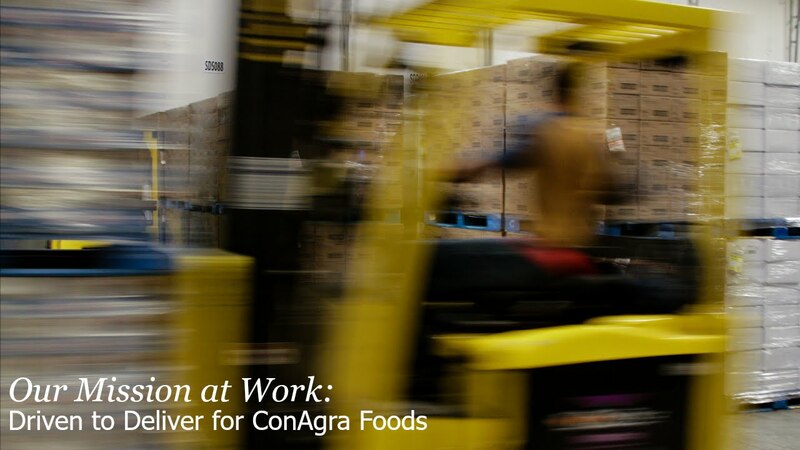 Watch the video above to see leaders from ConAgra Foods and Opus talk about their experience working together on the massive ConAgra Foods’ distribution center.